I am pleased to announce a contest for best casual/flight RCAF uniform! 1) Participants must be in the RCAF. 2) Submissions must include versions for both ladies and gentlemen of the RCAF. 3) All submissions must include the RCAF Insignia on the back of any included casual uniform jacket. 4) Rights to distribute Casual/Flight Uniforms will be given to the RCAF Marshal. 5) Winning Entries will be made available at low cost to RCAF members. Entries will be voted upon by all RCAF. I seldom wear Victorian dresses (take snapshots as evidence when I do!). 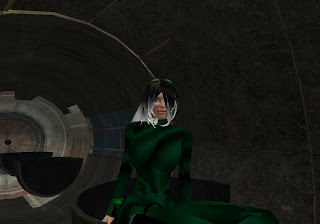 I like to mix outfits that give me a sort of Victorian Steampunk Mrs Emma Peel look, or a look that states: "Aviatrix: I'm hopping in and out of flying machines all day." I rarely find an outfit I wear by itself, preferring to mix 2, 3, and sometimes 4 outfits to find just the right look I want. Then there are the accessories...oh those wonderful and lovely steampunkish accessories! I was surprised and pleased to be asked to take part in the Exotic Women of Caledon Exhibit by Miss Autopilotpatty Poppy this morning. We are planning a photography session on Sunday morning and she has asked that I wear the newly released Royal Caledon Air Force uniform to represent women in uniform. I must say, it is indeed an honour to be in such great company as these amazing women of Caledon. Here are a few details about her forthcoming exhibit. On exhibit will be Autopilotpatty Poppy's photographic presentation of the Exotic Women of Caledon. Women from across Caledon have volunteered for this project. There will be approximately 36 women in the exhibit. These women have been asked to be photographed in their favorite location, using their favorite clothing and gestures. Miss Poppy's goal was to capture the personalities of these exotic women. Your generous contribution to one of Miss Poppy's donation kiosks goes a long way to help offset expenses of these exhibits. Without your help it would not be possible. 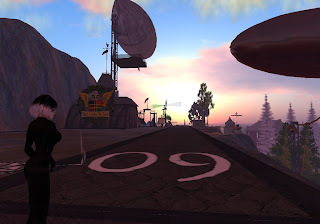 An experiment using iTunes with WeGame and Second Life. The location is Steelhead Harborside using Eladrienne Laval's Lighthouse as the center focus for all the camera shots. 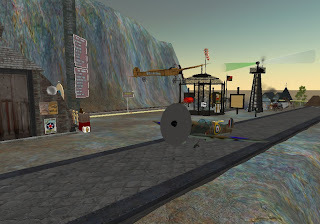 The hosts for February will be Ravishal Bentham and GoSpeed Racer in the Sailor’s Cove sim on Sunday February 24 from 1:00 PM until 4:00 PM SLT. The host for March is Crap Mariner…specific date and time are yet to be determined. April is still open if anyone would like to go for it. 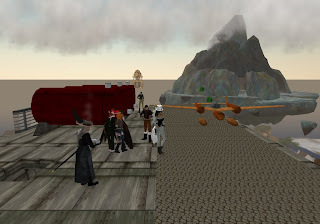 Anyone remember offhand when I hosted the first one? Was it May or June? So much has happened since then I can’t remember. 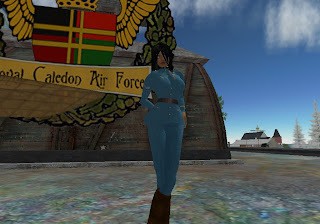 Royal Caledon Air Force Marshal Zoe Connolly salutes all those who were knocked out of the skies over Caledon on SLunday during rough sim-crossings.... May they recover and relog quickly. May they always find their vehicles and may all their vehicles be copy-able....Now get back in that crate and practice for RCAF Dogfight SLunday! One of the combatant Airships bumps into my Machinima Airship during the heat of Sundays air battle. Yes, sometimes photojournalism is a dangerous business. 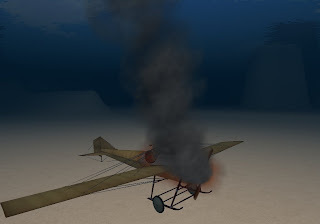 In Part 2 of Sundays Dogfight Machinima, I locked my camera on Royal Caledon Air Force AirChiefMarshal Sin Trenton. 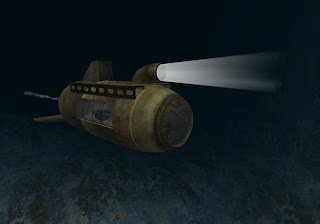 This machinima shows the action from Mr Trenton's Point-Of-View. RCAF Air Chief Marshal Sin Trenton drops into the Firth of Caledon with great humour and style...and a finger on the trigger....just in case! Royal Caledon Air Force dogfight exercises began Sunday 01/27/2008 over the Firth of Caledon. Pilots took-off from Connolly Aerodrome in Penzance and took part in a TCS System air battle that lasted 30 minutes. I first locked my camera on Group Captain August Breed when everyone was ready. 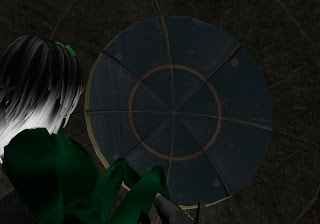 This machinima shows the action from Mr Breed's Point-Of-View. Tinies are always welcome in Caledon. 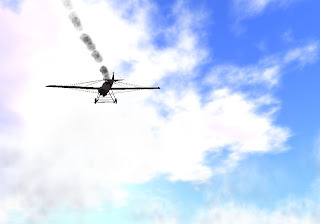 Here is a typical (not so smooth) flight back to Caledon Penzance from Caledon Cay. Things do not always rez when or where you want them, but intrepid and undaunted Zoe presses onward! 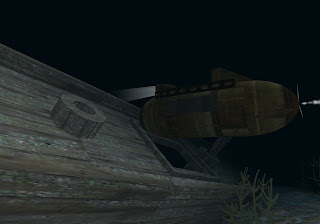 Test flight of the RCAF version of the Thadovian Airship over Steelhead Harborside. 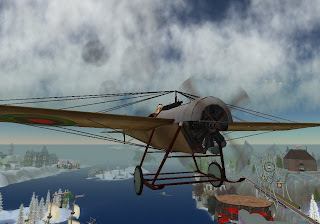 Fearless Pilots of the Royal Caledon Air Force test another flying craft over the Firth of Caledon. Test Pilots: Flight LT J8ke Hawker, Wing Commander Zabrina McMahon. RCAF Air Chief Marshal Sin Trenton has developed a nifty little seaplane with plenty of wallop. 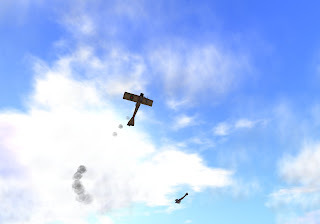 I'm very pleased with all my flight tests of the MM and recommend its use for all my officers. 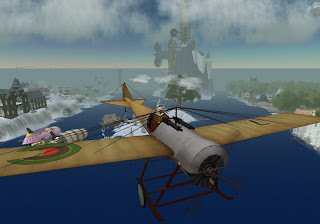 I envision the flying machine will also become a standard for any joint exercises with other military branches...providing air-cover for the Imperial Navy of Caledon, Middlesea Fleet and any allied navy. My friend Eladrienne Laval gave me this RezDay gift from her fine store. I love it! Yay, thanks Elle! Zabrina McMahon walks to my aerodrome in Caledon Penzance. 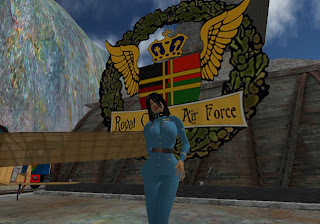 My half-sister Zabrina is fast becoming the official photographer and machinima documentarian of the Royal Caledon Air Force. I'm so proud of her...she had a much less evil-filled week. A typical SLunday night in Caledon. 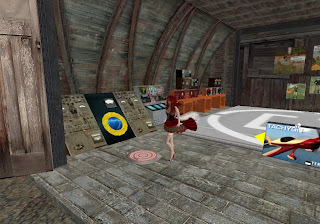 This time there was a dance-party in honor of Autopilot Poppy's new Art Gallery in Caledon on Sea. Our new Royal Caledon Air Force Uniforms will soon be here. RCAF Marshal Zoe Connolly models just one possible variation for the camera. A sim-cross that froze her mid-air! 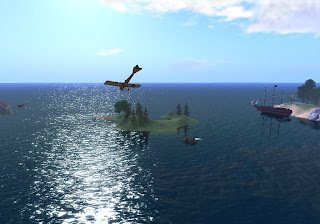 Flight controls were a bit sticky at first due to the cold weather, but I was able to fly over all four New Babbage sims....Babbage Square, Babbage Canals, Port Babbage and Vernian Sea. This is from the category...I love BSG, it's my blog and I'll post whatever I want! Thanks to ZenMondo Wormser for the link! 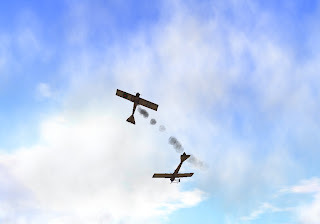 Dogfight Over The Firth of Caledon! Royal Caledon Air Force training over the Firth of Caledon. 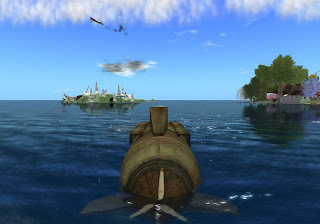 Air Chief Marshal Sin Trenton, Group Captain August Breed, and Flight LT J8ke Hawker fly and dogfight in GC Breed's 1912 Blackburn flying machines while Zabrina McMahon documents the thrilling action from her submarine. 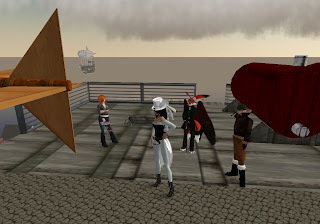 I decided to visit the sims of Plum, Lime, etc...A spot where I used to hang-out, making friends and learning about Second Life. It was once my homebase for many explorations. Alas no one I knew was there, my old friends had long since moved on after a series of unrelenting griefer attacks made life there impossible. I'm in yer camshot, runin' yer pitcher! 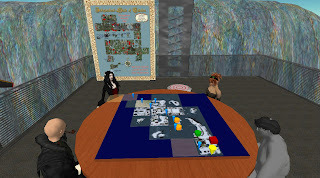 I returned to PLUM and surrounding sims - Just some of the places where I first hung-out in SL during January, February, and March of 2007. 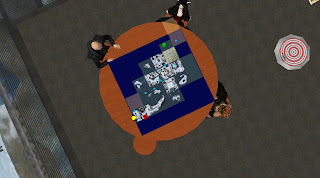 Sadly, there will be no SL Bloggers Convention as I originally planned for February 2008. I ran into legal issues that overwhelmed my original vision. When I return to the project there will be no such issues as it will be organized solely by myself and a few key volunteers. I felt like totally geeking-out today! Oh yeah! Special thanks to Royal Caledon Air Force Group Captain August Breed for providing RCAF staff with a fabulous new Blackburn 1912 monoplane. 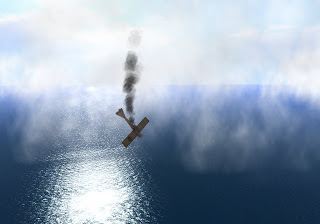 It is a dream to fly with my new Dual-Core Difference Engine and for the first time ever I was able to engage in an impromptu dogfight over the Caledon Firth. 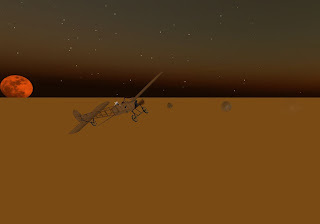 While piloting Mr Breed's Bleriot earlier in the morning, I was able to maneuver both an inside loop and an outside loop! RCAF believes Miss Earnshaw is from the far-off future where flying machines known as "Spitfire" rule the skies. Miss Earnshaw is fond of using explosive Teddy Bears.... Fiendish! 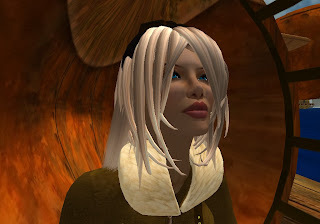 Photograph of Miss Molly Earnshaw, rogue time-traveler pilot and terrorist. 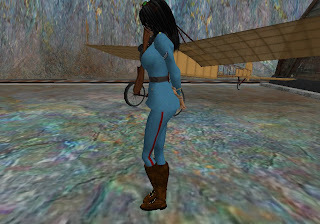 Miss Earnshaw in her futuristic craft known as "Spitfire"
RCAF Air Chief Marshal Sin Trenton makes a test flight of his new airplane at the Connolly Aerodrome in Caledon Penzance, a test area for many new inventions of flight. 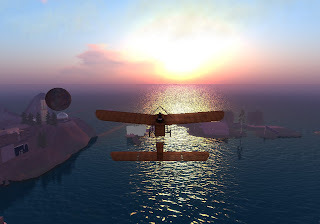 Flying August Breed's 1909 Bleriot above Steelhead City and Harborside. 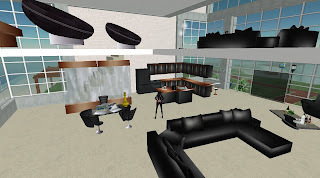 This was my first rental house in Second Life. 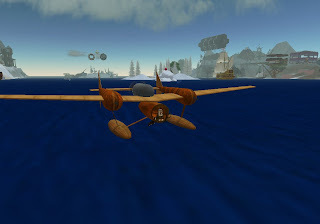 I used to think 500 prims and one little rented parcel was all I would ever need... Hah! 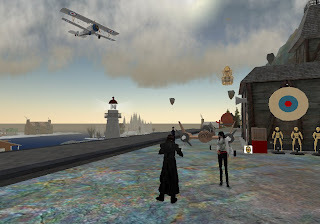 I had the great pleasure of hosting Miss Serra Anansi of Winterfell at my Aerodrome in Caledon Penzance. The event took place very early in the morning of Wednesday January 2nd. With Air Chief Marshal Sin Trenton at my side, we discussed approved flight routes from Caledon Cape Wrath into and around Winterfell. I want to assure our neighbors that the Royal Caledon Air Force is very sensitive to the rights and privacy of the Winterfell citizens to our north. We consider Winterfell an honoured ally of Caledon and we at RCAF will make great effort to obey their laws and customs.